Energy Secretary Ernest Moniz arrives in India today for high-level meetings that many hope will help ease recent diplomatic tensions between the two countries, including a spat over renewable energy. The U.S.-India Energy Dialogue was originally scheduled for January but was upended by bitter feelings in India over the strip search and arrest of a diplomat in New York who was charged with visa fraud. That tension has been exacerbated by an escalating trade dispute over solar panel rules. 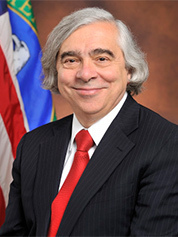 Energy Secretary Ernest Moniz Photo courtesy of the Department of Energy. Analysts say they believe Moniz's visit, which comes on the heels of an also-rescheduled trip by Assistant Secretary of State Nisha Biswa, can get the countries back on track on key energy and climate goals that could be beneficial. The meeting comes at a time when India's former hard-line, laissez-faire posture about developing nations and greenhouse gas emissions has begun to change. "I would like to see some answers about how you avoid this whole issue of trade disputes," said Arunabha Ghosh, CEO of the Council on Energy, Environment and Water, a leading nonprofit group based in New Delhi. Last month the Obama administration filed a World Trade Organization case over rules in India's solar program that it maintains discriminate against U.S. producers. "If we allow periodic trade disputes to occur on clean energy solutions, the only winners are going to be the fossil fuel industry," Ghosh said. His organization will be meeting with Moniz separately to discuss ways to encourage decentralized energy development for the 40 percent of the country still lacking in modern power services, and U.S. advocates say the time could be right for a new push for India to tackle hydroflurocarbons (HFCs), chemicals mainly used in refrigeration. "The energy dialogue in particular is going to be very important because it has been one of the more successful partnerships between the United States and India," said Anjali Jaiswal, senior attorney and director of the Natural Resources Defense Council's India Initiative. But with elections looming in India -- they will begin April 7 and continue on nine separate dates until May 12 -- others say energy is on the back burner. Narendra Modi, whose Hindu nationalist Bharatiya Janata Party (BJP) is favored to win, has released an energy action plan that aims to unite the country under a national grid using gas, thermal, hydro, solar, wind, biomass and nuclear. Yet while Modi has made nods to boosting renewable power in India, Wilson Center South Asia expert Michael Kugelman called the clean energy comments "boilerplate." While it is perhaps not surprising that climate change has not emerged as an issue in the elections, he noted that even energy access has not until recently been a serious campaign platform. "Energy issues are certainly significant, and for many people, particularly the poor and middle class, access to energy is certainly a major concern," Kugelman said. But he added, "It's just not seen quite as critically as other issues such as food inflation. That's the big, immediate, acute concern." Meanwhile energy action on a national level is largely at a standstill until after the elections. Ghosh said that is because under Indian law the government may not formally announce any new policies until a new government is in place, noting, "It's not a policy paralysis, it's just the law of the land." Behind the scenes, though, he and others said work on everything from renewables expansion to climate adaptation is happening, particularly at the state and local level. Jaiswal noted that the city of Ahmedabad in the state of Gujarat is preparing to release its 2014 Heat Action Plan, part of a first-of-their-kind series of studies on how Indian cities can prepare for extreme heat events fueled by climate change. Ghosh noted that Delhi has a new net-metering policy for residential photovoltaic. And David Waskow, director of the World Resources Institute's international climate initiative who just returned from India, said Gujarat along with Orissa and Chennai states have all done work to spur solar and wind construction. "It's very clear talking to folks here that what resonates is how to address climate change in a broader context of development," Waskow said. That's also the finding of a new report out this week by Yale Project on Climate Change Communication Director Anthony Leiserowitz. Leiserowitz and co-author Jagadish Thaker, based on interviews with 25 leading Indian climate policy experts as part of a larger study, found that the government's view on climate change is shifting from one of defensiveness over the country's right to continue emitting as it tries to pull millions out of poverty to one that recognizes that there can be "co-benefits" in aligning climate change objectives with development goals. "The analysis found that the prior prominent argument that India is too poor to redirect its resources away from poverty reduction and economic development has started to shift to a discourse of co-benefits," the report notes, citing an increasing focus in India on shifting its emissions trajectory "without compromising on the goal of increasing energy access" through renewable energy investments and the promotion of energy efficiency measures. Yet while India has some of the world's lowest per-capita emissions levels (1 ton compared with 17 tons of CO2 per capita in the United States), its absolute greenhouse gas levels have tripled since 1990. It currently is the world's third largest emitter, and its emissions are predicted to increase almost 2.5 times by 2035, according to the report. At the 2009 climate summit in Copenhagen, Denmark, the Indian government pledged to curb emissions intensity -- that is, carbon output per unit of gross domestic product growth -- by 20 to 25 percent by 2020 from 2005 levels. With all countries expected to put new targets on the table soon as part of a new global climate agreement that could be inked late next year, India's plans remain a mystery. Ghosh said a low-carbon working group set up by the government well before negotiators settled on a 2015 deal is expected in the coming months to issue a report on the country's state of play on emissions growth. For his part, Ghosh said he thinks India needs to do deeper sectoral analyses in areas like building efficiency and the cement industry to look for opportunities. "It might add up to something the government can commit to," he said. "I would think there's a basis for an ambitious way of dealing with our emissions." India's long-standing position has been that wealthy countries caused climate change and wealthy countries should solve the problem. And while it agreed to a new global deal that would be "applicable to all countries," it has since insisted that the current Kyoto Protocol structure that legally obligates only developed countries to cut carbon and allows others to act voluntarily and in exchange for funding should be preserved. It led in downgrading the word "commitments" of each country to cut emissions to "contributions," and though the change may seem only semantic, Indian leaders insisted it helped enshrine the idea that their carbon cuts would remain voluntary. Meanwhile, India has also done more than any other country to block efforts at ratcheting down HFCs through the Montreal Protocol treaty. Still, analysts insist that India also recognizes that the winds are shifting on climate change and that it wants to be part of the solution. "India has a growing international aspiration," Leiserowitz said. "India no longer sees itself as just another developing country. It sees itself as a global political leader, and it wants to assert itself as a global leader. Well, when you do that, it comes with leadership responsibilities." On climate change, for example, "You can't simply say 'that's not our issue.' So, the discourse is beginning to change."